Eating seafood for Xmas? Sounds awkward? As odd as it may sound to many of you, this ritual goes back to their Catholic heritage. For Catholic religion, Xmas Eve is one of the most sacred moments of the year, and the banning of eating meat is basically a reminder to consume food in austerity; to abstain completely from food, or at least refrain from indulging in opulent delicacies as a sign of respect and devotion of the Savior that will be born. In the past, this recall would be equal to “not eating meat” since meat was regarded as the only luxurious food that would only be rarely consumed and eaten during special occasions. Nowadays, Italians eat seafood, an ubiquitous staple of Italian modern food culture (and also one of the most costly foods…unfortunately). Since Xmas Eve was celebrated at our place, I am sharing one of the courses I prepared – a versatile dish that can be prepared not only for the holidays. 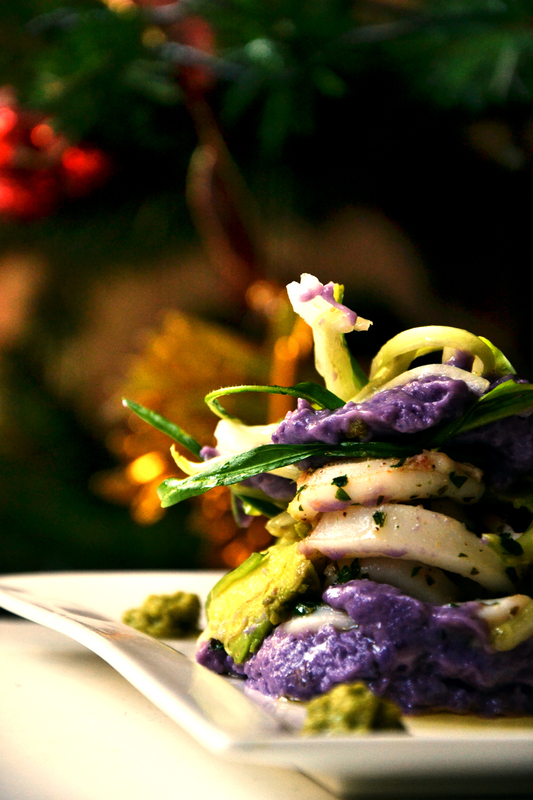 The following antipasto is made with beautiful Mediterranean calamari, crunchy Roman puntarelle, and earthy stunning Italian purple potatoes, all paired with some Latin American ingredients (lime, avocados and cilantro), which add that special kick to this dish. 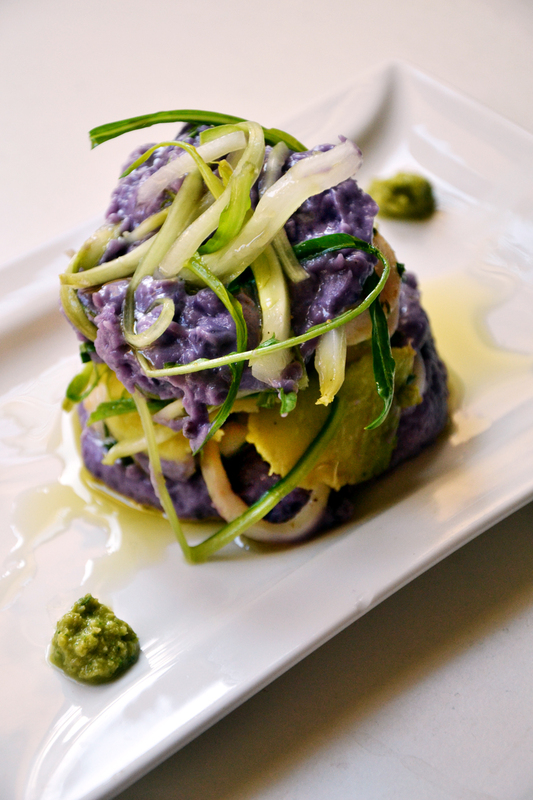 Note: If you cannot find purple potatoes in your country, a delicious alternative is using sweet potatoes. Not only these are earthy and great tasting, but their sweetness contrast perfectly with the acidity of lime and pairs really well with calamari. Put potatoes into a large saucepan. Cover with cold water. Bring the water to a boil. Add some coarse salt and cook until tender. The potatoes are done when they feel very tender if you introduce a fork and it runs smoothly into the flesh. Drain potatoes and peel them. With the use of a fork, mash the potatoes adding olive oil and some water. Keep in mind these kind of potatoes are harder and grainier, so it could be tedious to mash these potatoes one by one. Do not expect a very velvety consistency, but if you desire one, you can use an immersion blender to obtain it. Cut each calamari into rings. Add salt and pepper. In a skillet heat some olive oil, add a garlic clove cut in half, add calamari and stir fry until cooked through and opaque; about 2-4 minutes. Add the cilantro and the juice of a lime. Set aside. Discard the garlic. Cut the avocado in half. Using a tablespoon carve some flesh from the avocado and set aside. For each portion, you should be able to get 3-4 spoon shaped slices. In a bowl, combine puntarelle with some olive oil, and lime juice. Add salt and pepper to taste. 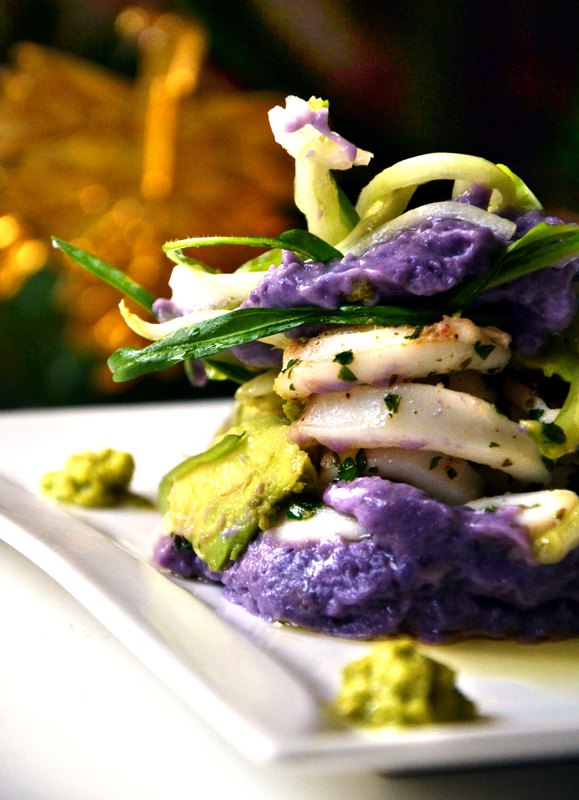 Using a round pasta cutter – placed on a rectangular white plate – place some potato puree, then add the calamari, and add 3 to 4 avocado slices. Add puntarelle and add more potate puree. Finish it with more puntarelle on top. Carefully take off the round pasta cutter. That is one of the most stunningly beautiful dishes I have seen…love the bright colors. I hope your Christmas was wonderful. Wishing you and your family all the best for the new year. Thank you Karen!!! I hope you Xmas was wonderful too! Hope this year is full of blessings for you and your family! What a beautiful and colorful dish! Thank you!!! 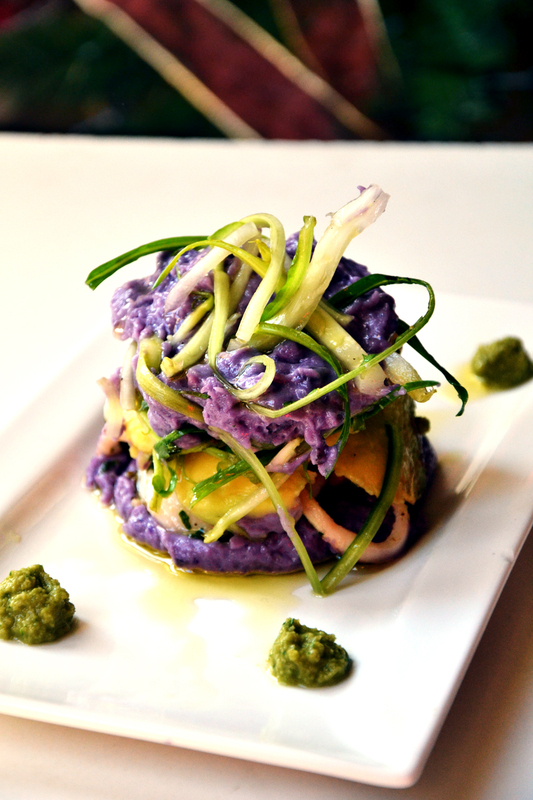 The purple potatoes make the dish really colorful!! Absolutley stunning and it’s so amazing the potatoes keep their colour. We had a big seafood meal too 🙂 Buon anno to you and your family. Thank you so much Chica!! Hope this year brings great things for you and your family!!! Ciao! !